A housing campaign organized by a group of graduate students marched for an hour around the Chancellor’s Complex in favor of a graduate housing rent-freeze on April 2. The demonstration was organized after Housing Dining Hospitality overruled a recommendation by the Associated Residential Community Housing Advisory Committee to freeze graduate housing rental rates for the upcoming year. Petia Yanchulova Merica-Jones, a member of ARCHAC, told the UCSD Guardian in an email that the committee had rejected HDH’s proposals to increase the cost of graduate housing over a four-year period on March 28 due to a lack of “sufficient information and financials (debt financials, cash flows) to motivate rental rate increases.” The committee voted 6–0 in favor, with two members abstaining, for a rent-freeze for the 2019-2020 school year. On the morning of April 2, the HDH director of housing sent an email to residents in graduate housing regarding the new rental rates set to take effect for the 2019-2020 school year. The graduate housing communities of One Miramar St., South and Central Mesa, The Rita and Coast will see rental rate increases of 3 percent. Mesa Nueva rates will increase by 5 percent for all units except for studios, which will increase by 6 percent to account for the “greater correction on the interest-only rates set in 2018 since [studio units] were priced significantly lower than other unit types based on construction cost,” according to the email. HDH is able to overrule ARCHAC’s recommendation because the committee is advisory and its decisions nonbinding. Nuevo East and Nuevo West are a part of the $1.6 billion UCSD facility expansion. In response, a group of graduate students called for a march near the Chancellor’s Complex later that morning. Approximately 30 student demonstrators wore red shirts that read “Educate! Agitate! Organize!” on the front and “UC Student-Workers Union” on the back. The protest was independently organized by the student-activists and not directly affiliated with the SWU. 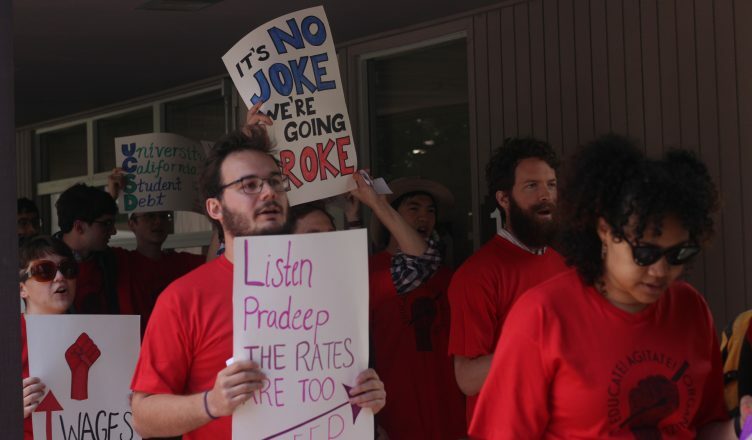 The marchers’ slogans of “Listen Pradeep, the rent is too steep!” and “Listen Pierre, it’s just not fair!” directly referenced Chancellor Pradeep Khosla and Vice Chancellor and Chief Financial Officer Pierre Ouillet, two key UC San Diego administrative figures. In a document provided to the Guardian, the students listed the concerns they had with HDH’s decision to increase rental rates. Yanchulova Merica-Jones said that her concerns with the UCSD administration’s actions are a matter of transparency. Sven Brueggemann, a graduate student and the leader of a similar march for housing affordability on February 19, was critical of the UCSD administration’s overall attitudes and policies towards student housing. “The structure of [the] UCSD administration set up for housing, and their policy, isn’t for affordable housing, but rather to facilitate [continued] UCSD expansion,” Brueggemann told the Guardian. Yanchulova Merica-Jones urged her fellow students to join the campaign’s efforts for a rent-freeze and called for them to speak up and voice their concerns. At the time of publication, a rent-freeze petition has reached over 500 signatures, and more than 150 emails have been sent to UCSD, HDH, and ARCHAC. In a statement provided to the Guardian, HDH defended its decision to increase rental rates, arguing that it has “spent a significant amount of time” meeting with ARCHAC to discuss the 2019-2020 housing rates. HDH also applauded ARCHAC’s work and the feedback it received from the committee. HDH noted its own efforts to increase the number of graduate students who are able to live on campus. “By 2020, as part of UCSD’s Long Range Development Plan, the campus plans to increase that number to 50 percent of graduate students, allowing more students to take advantage of the campus’ below-market rental rates,” the statement added. Hosam Yousif, a graduate student and one of the activist leaders of the housing campaign, spoke at a meeting with the Associated Student Council on April 3. No further immediate protests have been planned, but members of the housing campaign plan to continue to inform both graduate housing residents and undergraduate students of HDH’s decision to raise graduate housing rental rates for the upcoming year.